The challenge first originated after a picture of a woman sculpture circulated the internet. In what appears to be the new Slenderman to target children online, a new creepy character has taken over the internet called ‘Momo’. 'Momo' is a viral challenge that encourages kids to add a contact on WhatsApp who will then hound them with violent images and dares, the last one being for the child to commit suicide. The grotesque woman has enlarged features including bulging eyes. It had been ripped off from Japanese doll artist Midori Hayashi. Midori is known for creating dolls related to horror and recently displayed his work in an art gallery in Tokyo, Japan. To enhance the creepy factor of the dolls, the artist uses animal remains to create the bodies of his figures. But he is especially focused on creating lifelike eyes in each of his dolls, which is a notable feature in the 'Momo' doll with huge, bulging pupils. Besides the huge eyes, the doll also has a large mouth that curves upward along its slim face that covers almost the entirety of his face. Midori, despite creating the doll, is not associated with the recent challenge that has circulated the web. The challenge — which reportedly has already attracted kids in the United States, Argentina, France, Mexico and Germany — might be linked to the death of a 12-year-old girl from Escobar, Argentina. The Momo challenge comes after the Slenderman challenge took over the internet a few years ago and resulted in some children being stabbed to death by their friends. The fictional character — which originated from an art contest in 2009 — featured a creepy figure with long limbs and a blank face. 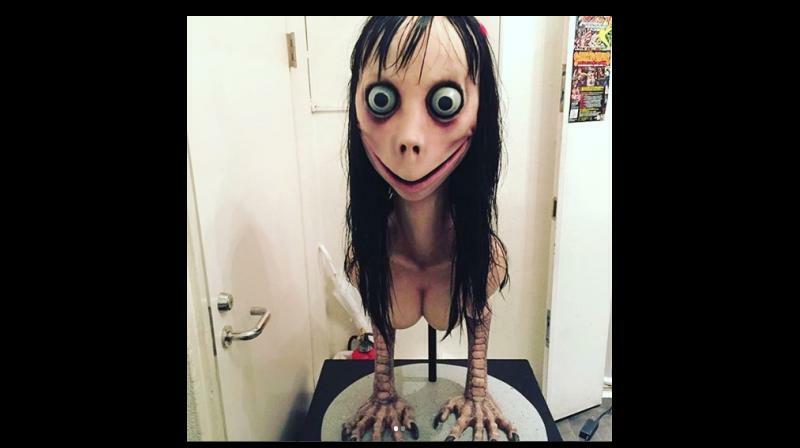 After the art started to circulate similar to what has happened with 'Momo', teenagers and children started to get affected by the creepy stories created about the figure. Morgan Geyser, a 15-year-old from Wisconsin, lured her friend into the woods in 2014 with another girl and stabbed her 19 times to death. Afterwards, Morgan claimed she did it to impress the fictional character Slenderman and has since been sentenced to 40 years in a psychiatric hospital. ■Blue Whale-like Momo WhatsApp challenge claiming lives?